What’s in a name? 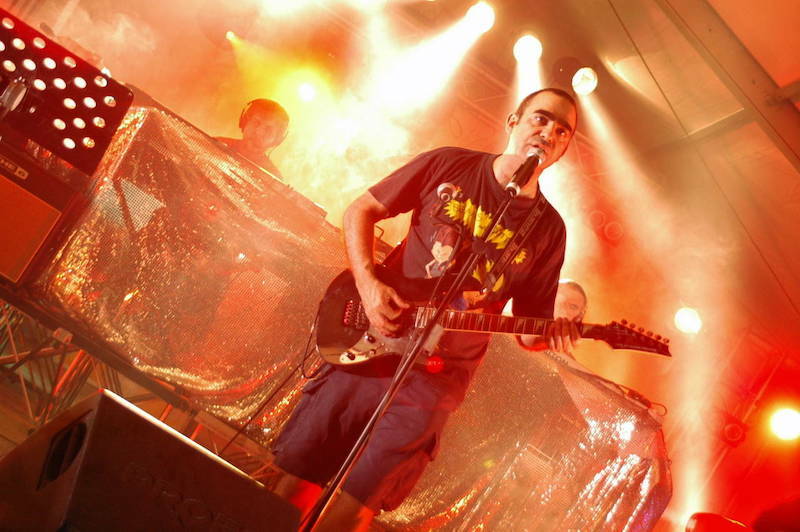 Well, in the case of the band Elio e le Storie Tese, which translates to Elio and the Tense Stories, the name indicates that the band is one of the most peculiar to appear on the Italian music scene in the last 30 years. Singer Stefano Belisari, aka “Elio,” and “Le Storie Tese,” the group of performers behind the leader, are talented musicians who are able to play many instruments with great skill. What is wonderful about this group is that their songs are nothing like normal Italian pop music. Instead, Elio and his motley crew create songs filled with wit, sarcasm, irony and comedy. The band performances are known also for their theatricality, an extra factor that helped them to achieve a cult status among Italian music fans. Elio e le Storie Tese count among their original musical inspiration Frank Zappa, and just as Zappa and his band, they embraced a mixture of styles and performing abilities which make them difficult to categorize: a great compliment, considering their uniqueness and quirkiness. Elio e le Storie Tese began their career more than 30 years ago, in 1979, as a part of the lively end-of-the-70s musical panorama of Milan. They started as an underground rock band, yet they already had some of those peculiarities which were to make them popular some years later; Mangoni, one of Belisari’s old schoolmates, used to join the band every now and then to choreograph dance routines during live shows and to sing songs in his screeching, high-pitched, often out-of-tune voice. And it was this apparent musical style “cacophony” that made Elio and his gang of musicians popular: their skills as performers were undiscussed, but they willingly combined them with funny and sometimes coarse performances and sense of humor. “Dissacrante,” we would say in Italian, desacrating: and this is very much what Elio e le Storie Tese are in the Italian musical panorama. The level of fame achieved by Elio e le Storie Tese has granted them access to the most prestigious musical events in Italy, like the Sanremo Music Festival, to which they partecipated in 1996 and in 2013 as competitors. In 1996, in spite of being very much the antithesis of the type of music endorsed by the Festival, they reached the second place and won the Premio della Critica Mia Martini, awarded by the competition’s professional jury. In 2013, they once again won the Premio della Critica Mia Martini and gained the second place in the overall competition. Following their Sanremo adventure, they published a new work, the “Album Biango,” the title itself a humorous nod to the Beatles “White Album” (in Italian, “Album Bianco,” which they misspelled to reproduce a dialectal inflection). Their relationship with Sanremo is, indeed, quite special: in spite of embodying a type of music which is, under many respects, untithetical to the melodic and traditional roots of the Festival, Elio e le Storie Tese have become synonym of quality Italian music, and are today well accepted within the usually strict Sanremo’s musical circle. They have been involved with the Festival in other occasions as part of the presenting staff, as well. In 2009, they released the album “Gattini” (kittens), where some of their best known success have been arranged for and performed with a full orchestra, the definitive proof of the band’s huge capabilities as composers. At the dawn of their career, Elio e le Storie Tese were part of that underground panorama spawned from the demise of punk. They cross-fertilized with Situationist Dadaism, to become one of the most entertaining bands to currently grace a stage. Their humor is not always easy for non-Italians to comprehend, as it is most often mocking traditional Italian habits and customs, but with some help from an Italian friend, you will certainly become able to appreciate Elio’s unique sense of humor and satire. One of the band’s most famous songs, “Cara ti amo (Mi sento confusa)” irriverently speaks about love relationships and the insecurity and confusion they often create. As it touched upon a very common situation, the song became quickly a pop culture phenomenon that trascended demographics: Elio e le Storie Tese finally had demonstrated they were not only a band for teenagers. Being trendsetters, in 2004 the band became the first in Italy to sell instant CDs of their live performances immediately following the end of the show. The band called them “CDs brûlée,” as they were “burned” on the spot, like caramel on a crème brûlée. If you want to know more about Elio e le Storie Tese and their shenanhigans, keep track of their activity on their official website.